Drummer John Bonham was the heartbeat of Led Zeppelin. When his great heart stopped the life went out of the band. It was a tragedy for rock music as well as for friends and family when he died at the age of 32 on September 25, 1980. After several personal tragedies had rocked the band in the mid-70s, it seemed as if Zeppelin were poised to make the ultimate resurgence. Instead it all came to a dramatic end when John died in the throes of rehearsals for what would have been the band’s biggest tour in years. To understand why Bonham died so young we must also understand the pressures of life with the greatest rock band in the world. Being in Zeppelin brought him great rewards, fame and success, but it also undermined his personality and health. Yet Bonham didn’t get to become the drummer in Led Zeppelin by being the shy and retiring type. He attacked his kit with gusto. But despite his image as a wild man of rock, his attempts to emulate the manic destructive intensity of his pal Keith Moon, of The Who, did not come naturally. He was hard-working and had a huge appetite for life. When he became hugely wealthy from the success of Led Zeppelin he indulged in his passion for fast cars but also spent wisely, creating a happy home for him and his family at the Old Hyde in Worcestershire. For John Bonham there was no place like home. He hated flying and sitting around all day waiting for a gig. The endless Zeppelin tours he had to go on became a drain on his stamina and confidence. There was the adrenalin rush of playing explosive music every night to thousands of screaming fans, but after that came the need to unwind – usually in a succession of faceless hotels and bars. Life became a blur of rioting fans, speeding limos, booze and groupies. It was fun at first, but powering-up the Zeppelin machine soon became a daunting task. 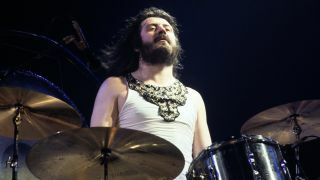 John Henry Bonham was born in Redditch, Worcestershire, on May 31, 1948. His father Jack ran a building company and employed both of his sons, John and Michael. Aged five John began to show interest in music. At home he began drumming on a bath salt container fitted with strands of wire on the bottom to make a crude snare drum. After adding pots and pans to his armoury, when he was 10 his mother got him a real snare drum. Then his dad bought him a complete kit. As well as working for his dad as a builder, John drummed with local bands. The Beatles era was dawning, but Bonham had a taste for jazz drummers like Gene Krupa, Joe Morello and Sonny Payne; he loved their stick-twirling showmanship. He took lessons, but developed his own hard-hitting rock’n’roll style. As he gained confidence he would go up to a bandleader and say: “Your drummer’s not much good, is he? Let me have a go. I’ll show you.” He would then take over the hapless drummer’s kit, pound it to bits, and take the guy’s gig. In 1965, at the age of 17, he married his girlfriend Pat Phillips. As money was tight they lived in a caravan that was owned by John’s father. Later they moved into a high-rise flat in Dudley (where they were actually still living when the first Led Zeppelin album was released). In 1965 he joined the Crawling King Snakes, where he met Robert Plant, who thought Bonham was a flash whiz-kid. Despite much banter and rivalry the two of them became firm friends. Bonham left the Snakes after a few months to rejoin A Way Of Life. Plant and Bonham were then reunited in the third and final line-up of Plant’s group Band Of Joy in January 1967, wearing the new hippy fashion of kaftan, beads and bells. One person decidedly more impressed was a youthful Phil Collins, who caught Bonham with Rose at London’s Marquee. Meanwhile, down in London, Jimmy Page, John Paul Jones and Peter Grant were putting a band together from the ashes of The Yardbirds. They persuaded Robert Plant to join, who in turn recommended Bonham for the gig. The drummer took some convincing, but within weeks he had joined Page, Jones and Plant in the studio. He told astonished mates back in Birmingham that he had just earned £3,000. With Bonham on board, the New Yardbirds, as they were still called, played their first gig, in Copenhagen on September 14, 1968. The way in which Bonham had galvanised the band on those early gigs had a lasting influence throughout the recording career of Led Zeppelin (as they had now become). His dynamic playing perfectly suited such arrangements as Communication Breakdown, Stairway To Heaven, Kashmir, Achilles’ Last Stand and Trampled Underfoot, while his thunderous backbeat on When The Levee Breaks influenced a new generation of drummers. Meanwhile the flow of hit albums and sold-out concerts for Zeppelin meant that his world changed virtually overnight. The once poverty-stricken Bonhams could afford flash cars, a big house and a champagne lifestyle. But he still had to work for a living. Out on the road, the 21-year-old Bonzo delivered a 20-minute, blood-spattered drum solo every night. And being the powerhouse of the energy-sapping Zeppelin show left him on the verge of collapse. He hated flying, which made him physically sick. Holed up in hotels, the only way for a travelling musician to immunise himself against the routine was to take a drink or two, and perhaps experiment with drugs. Right from his teenage years, Bonham had enjoyed a beer. But he got boisterous after a few pints, which led to his reputation for mayhem. His pranks soon rivalled those of Keith Moon for outrage and destruction. Anyone getting too close found their clothes ripped and sprayed with lager. Back home, Bonham returned to normality, and raised son Jason and daughter Zoë. He busied himself running his farm and breeding Hereford cattle in the calm peacefulness of the Worcestershire countryside. The real John Bonham preferred the bricklaying and decorating he’d learned from working with his father to carousing in California. Yet he also harboured a love of danger – epitomised by driving his drag-racing car at 240mph in Zeppelin’s movie The Song Remains The Same and his evident pride at son Jason’s performances for the Kawasaki Schoolboy motocross team. After earning a fortune, Zeppelin became tax exiles, which meant living abroad. Then came a series of mishaps that dogged the group and undermined the drummer’s confidence still further. Bonham’s boisterous good humour began to give way to dark brooding and fits of anger. Surrounded by hired security men, he may have felt invulnerable. But he overstepped the mark when he joined Peter Grant, tour manager Richard Cole and crew member John Bindon in a vicious assault on an American security guard at the fateful concert at Oakland Coliseum, California, in July 1977. Afterwards Bonham, Grant and the two Zeppelin henchmen were arrested. Later it led to fines and suspended sentences – and to Led Zeppelin never returning to America after this tour. When Led Zeppelin played Knebworth in 1979, Bonham played well enough on the two landmark UK shows. But while on a German tour he began to exhibit signs of fatigue. At a show in Nuremberg, after three numbers he was taken ill. He then appeared unwell for the rest of the tour. That day at Page’s house John started drinking at lunchtime and carried on until midnight. He allegedly got through 40 measures of vodka during a marathon 12-hour session. After falling asleep on a sofa he was put to bed by his assistant and laid on pillows for support. The following morning there was no sign of him. John Paul Jones and road manager Benje LeFevre found him apparently unconscious. They tried to wake him, then realised he was dead. Everyone was saddened, and even angry, at the waste of life. Peter Grant went into a depression that lasted several years. John’s death left the Bonham family devastated. It was revealed at the inquest that he died from inhalation of vomit during his sleep, ‘due to consumption of alcohol’. The verdict was accidental death. The funeral took place at Rushock Parish Church in Worcestershire on October 10, 1980, attended by mourners including family, friends and his bandmates. Tributes poured in from stars such as Paul McCartney, Phil Collins, Cozy Powell and Carl Palmer. Led Zeppelin could have carried on with another drummer, as The Who had done after the death of Keith Moon, but realistically no one could replace him. Led Zeppelin had officially broken up. Other drummers, including Phil Collins and Jason Bonham, have played on Zeppelin ‘reunions’ since. None could hope to match the power, magic and presence of the much-loved man who once told Robert Plant he was the greatest drummer in the world. • Additional information from Late Nights, Hard Fights: My Brother John by Michael Bonham and Jerry Ewing.